The day had dipped into a chill after the storm passed. There was no other place I’d rather be than in my kitchen with a pot of my mom’s chicken sotanghon soup simmering on the stove. With Dennis immersed in his book in the couch. With Stanford curled up on the floor next to him. With Eponine crying in the background. With our parol twinkling in the porch and our Silvertip glowing in the corner next to the windows. It had been raining all weekend, which I didn’t really mind. Fiddling around in the kitchen was a welcome change from the chaos of past weeks. A perfect pause to enjoy our new home without moving boxes and packing tape, without paint brushes and pruning shears. The kitchen smelled of browned garlic and onions. It smelled of just cooked rice. I ladled the soup into bowls and sprinkled slivers of green onions and chicharron, the same way my mom serves it. Accompanied by a small dish of patis, of course. I could hear the quiet crackle of chicharron in my soup. Like the quiet click of the rice cooker, it was music to my ears. Dinner’s served — it triumphantly declared! I wrapped my clammy hands around the bowl of hot soup to warm them. No other place I’d rather be, indeed. Soak sotanghon noodles in water for at least 10 minutes. When the noodles have softened cut them into shorter lengths using a pair of kitchen shears. Keep them in water and set aside. Heat achuete oil in a large pot over medium-high heat. Saute garlic until lightly browned. Add onions and saute until fragrant and softened. Add carrots, cabbage, and shredded chicken breast. Toss to coat chicken and vegetables with oil. Add chicken stock. Drain noodles and add them to the pot. Add fish sauce. Bring to a boil and simmer until vegetables and noodles are cooked. Season with salt and freshly ground pepper top taste. Garnish with green onions and chicharron and serve hot. 1. Sotanghon noodles, also called Chinese vermicelli, cellophane, glass, or bean thread noodles, are made of mung bean starch. It shouldn’t be confused with rice vermicelli, which is made from rice. Dried sotanghon noodles are available in most Asian stores in 3.5-ounce (100-gram) or 7-ounce (200-gram) packages. 2. The soup can only be as good as the stock. For a more flavorful chicken stock, roast chicken bones before simmering them in water with celery, carrots, and onions. Also, add pork bones or pork belly to the mix. 3. Chicharron makes great croutons for noodle soups. My wife and I just returned from the Philippines where we just purchased the land for our eventual retirement home–so congratulations to you on this, your first! Upon retirement, I hope to keep active with either a small cafe or a catering business, probably specializing in Spanish tapas and such, and reading your blog keeps me grounded into the Filipino sensibilities that their taste might prefer–not that I’m averse to pushing their boundaries with truly authentic Spanish cuisine. When we returned from the ‘fantasy islands’ I ended up sick for several days with some residual intestinal bug, not to mention the slow passage of a kidney stone, but unfortunately I associated my poor feelings with Filipino food and was put off of it considerably for a number of weeks. Still…can’t keep a good cuisine down for long. Wow, such beautiful writing… I can almost hear Les Miz playing and smell the lovely aroma of soup! For whatever reason, I’m not very fond of sotanghon noodles, but I’ll give them another chance so I can try out your recipe. Jun, I just finished making this on a chilly rainy Seattle afternoon. 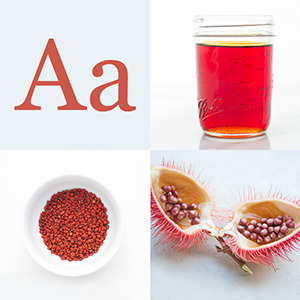 I had gone to the Filipino market in Shoreline for annatto seeds and to look for a parol, but no luck on the latter. As I soaked the noodles and sliced the vegetables, i could feel the weight on my shoulders slipping away. Thank you for a wonderful recipe – as the chicharrones crackled, I felt as though I could l finally let go of a long week. Congratulations, Chris! If I were you, I’d tend to a small organic farm and source most of your ingredients for your tapas-style restaurant from your own farm. Best of luck. Retiring back in the islands sounds like a great idea to me. Thank you so much, Aimee for writing and for trying out the recipe. It’s amazing what a bowl of chicken sotanghon soup can do. Happy Holidays to you and your family! Hi Jun, Sotanghon is my mother’s favorite chicken noodle soup, except she sautes very thin spears of ginger along with the onions & garlic and she uses chicken wings instead of breast because of the fat that renders from the skin. It adds richness to the broth. I will fry some chicharron to serve with it. We never did this, sounds perfect, the juxtaposition of silky noodles and crisp, salty chicharron with the mild flavour of the broth. It’s getting cold in Canada now so I will make this for the family. Jun, so enjoying your memories! I’m transported! Thank you. 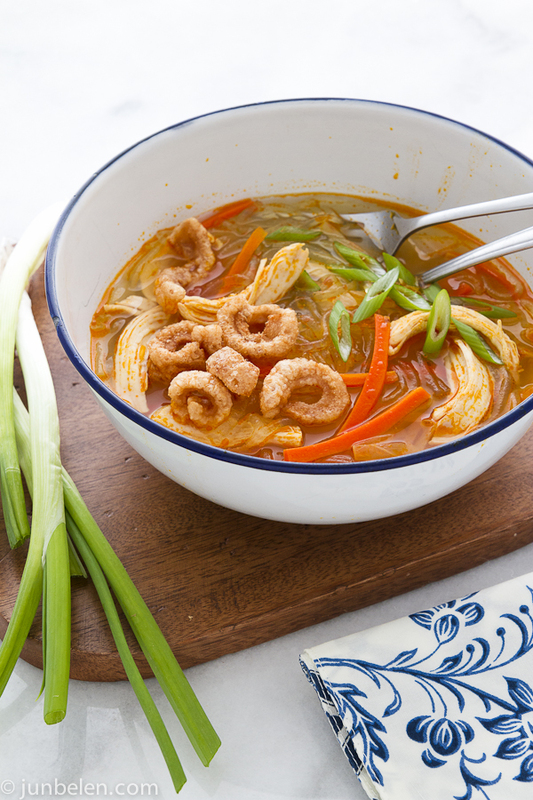 Yes — the crispy chicharon adds texture to the soup. I hope you’ll try it. And, yes, the chicken wings (and bones) add richness to the stock. can’t wait to try the aristocrat chicken bbq and the sotanghon soup!